Jesus came to establish spiritual leadership in His church that is based on humble example, godly character, and personal power; not on human control, institutional authority, or positional power. 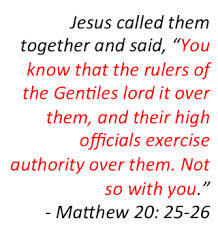 Jesus wants his leaders to facilitate His meetings, not to dominate them by “lording it over” other Christ-followers. What are we supposed do in church? 1 Corinthians 14:26 tells us: “When you come together, everyone has” something to share. Therefore, New Testament based God-gatherings involve everyday people actively doing the word of God as they participate in honest, open sharing and caring surrounded by the loving presence of the living, resurrected Jesus Christ! What do you do in church? Since God has given Christ-followers “spiritual gifts” for the good of the whole church (see 1 Corinthians 12:7), why are most church meetings set up so that they feature the same person’s gift week after week, while the other spiritually gifted members are required to ignore their gifts and passively listen to the featured one? What happens in a God-gathering? When people gather to all listen to and obey the living, resurrected Jesus Christ amazing things happen. As individuals began to share what they heard from God, His presence becomes real to everyone in the meeting. You can’t demonstrate the reality of God’s presence by giving a weekly talk about Him to a group of people. –You can demonstrate the reality of God’s presence by allowing a group of ordinary people to listen directly to God and then to say and/or do what He tells them to. Try it and see! In order to reach the Dones, the Nones, and the Millennials, the 21st church must move beyond mere Sunday morning talks and into actual demonstrations of God’s presence and power! Paul of Tarsus put it this way: “My message and my preaching were not with wise and persuasive words, but with a demonstration of the Spirit’s power,” 1 Corinthians 2:4. This entry was posted in 1 Corinthians 14:26, 1 Corinthians 2:4, Bible quotes, Christian leadership, demonstration of the Spirit's power, doers of the word, each one has a psalm, God-gatherings, James 1:22, Matthew 20:25, not hearers only, not with enticing words of men's wisdom, Paul of Tarsus, Quotes, When you come together and tagged Dones, facilitation, leadership, lord it over, Millennials, Nones, spiritual gifts, spiritual leadership. Bookmark the permalink. I couldn’t agree more Steve! !